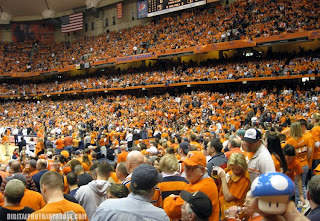 Just minutes before tip off inside the Carrier Dome or also known as, 'the loud house', number 4 ranked Syracuse University's mens basketball team was warming up to take on number 7 ranked Villanova Wildcats. With Syracuse's victory of a final score of 95-77 and the possibility that two days later they could be ranked number 1, isn't the real story or the significance of this game. What makes this day, moment, place so special was that it was an on campus NCAA game attendance record. It was actually the fourth time in seven years that Syracuse University mens basketball broke this record. The record was set at, 34,616, and is sure to be broken again. This game was so large that ESPN's College GameDay telecast was done live in the Carrier Dome earlier in the day. Also, the tickets to this game was sold out weeks in advance and if you wanted to attend this record braking attendance then one could pay up to $750 dollars.